Businesses need secure, timely and convenient ways to collect, manage and protect money. At the same time, they must be able to make prompt payments to employees and suppliers. Your Hometown Bank business checking account opens the door to a complete set of products and solutions-based services to help manage and safeguard your money – so you can focus on managing your business. File upload or our easy to use Premier ACH software. Make electronic payments such as direct deposit, expense reimbursement, vendor payments and more. Create and save frequently used payment and transfer profiles. Distribute funds from multiple offices or locations. Provide yourself and your employees with a fast, safe and easy way to make business purchases using our debit card service. You’ll maintain spending control at the card level by setting daily and monthly limits for point-of-sale purchases. Generate secure, itemized lists of employee purchases on your monthly Hometown Bank business checking statement. These lists display the card, merchant name, location, date and amount of each purchase. Save time by not having to make or approve every purchase yourself. Set custom daily limits for purchases. For more information and to apply for our free business debit card service, contact your Relationship Manager today. Already have a Hometown Bank business debit card? To activate your card, or reset/select a personal identification number (PIN) please call 1-800-567-3451. Our automated system will guide you through a few simple steps for easy access to your money. Transfer funds quickly and reliably, into or out of your account, domestically or outside the U.S.
Set up ACH debits and speed up your collection of receivables. Concentrate funds from multiple offices or locations. Hometown Bank's Remote Deposit Capture enables businesses to scan check payments onsite and securely transmit them right to their account. See for yourself how Remote Deposit Capture can streamline your banking! Make deposits whenever it's convenient. Print or save separate items, front and back. Track back provides easy review or verification. Won't affect computer system performance. Access funds sooner with same-day deposits. Manage deposits of multiple business locations from one office. Gain better insights with the numerous reports available. Checks handled by fewer individuals. Multiple security levels for access. Personalized user IDs with password protection. Designate user access for one or multiple locations. Additional security using multi-factor verification. Manage your cash online. Hometown Bank provides a convenient, secure way to access account information, payroll delivery and funds transfer services. Conveniently view your account balances and activity. Efficiently manage payments, transfers and deposits. Securely access accounts and customize security levels. Receive personalized support from Hometown Bank. 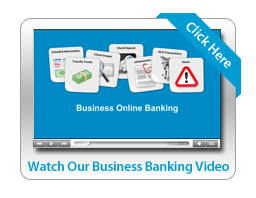 See for yourself how convenient it is for your business to bank online. Create customized alert messages for low account balance, specific activity, reminders and more. View history of debit and credit activity. Place your own stop payments. Use the account activity report to view scheduled and completed transactions for a specific date or range you specify. Access up to 90 days of records. With the account summary report, review account balances on all business accounts for the current business day. Perform payment and advance transactions. View all existing loan and credit line balances and activity. Choose payment options, including principal only. Unique user IDs can be used to control access at various security levels. Set up multiple authorization levels and approvals. *Businesses should perform a risk assessment to evaluate usage of online banking within their organization. Controls should be exercised relative to delegation of authorities and responsibilities of personnel. A timely and structured review of those controls is recommended as well. Should an outstanding balance occur on your line of credit, a credit sweep is a useful strategy in protecting your credit rating. We move (sweep) any excess checking funds to reduce your principal balance and lower your interest expense. If your checking account falls short in covering checks or debits, your line of credit will automatically fund the shortage up to its credit limit. Consolidate your disbursements and excess balances by merging the funds of various subsidiary accounts into one master account. Then, transfer money into the subaccounts only as needed.